You're IT The Round Hill Store! Three questions with Robin Vanacore, owner of The Round Hill Store. Actually, I did not start our business but am the fourth generation to own and operate it. Why did we agree to continue the family business? After all, it is a huge responsibility. To carry on the business in our small community in the backcountry of Greenwich requires many hats and lots of help from the neighbors. It is also an inherited family tradition that would be difficult to abandon. Having grown up in the neighborhood, the store has been a dependable fixture. Having worked in the store since the age of twelve I know many of the families that live here and have often been asked to "keep it the way it is" or "we don't want a supermarket on the corner" which means the community wants to maintain the tradition and history of our business as much as we do. So my husband John and I agreed to continue and expand the business when another family member no longer wanted the obligation. I wish I could afford to give our historic building a makeover. Since our store was built in 1801, it requires tender loving care, in other words, it is always in need of repair. Not that I would change the treasured nature of the building, but upgrade and renovate the structure and utilities, replace the deteriorating floor and bring it back to its original splendor. I would also like to offer take-home meals for our working families. This too would require major renovations. 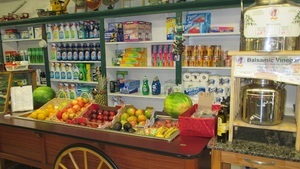 The Round Hill Store is located at 369 Round Hill Road in Greenwich. Visit them online here. The Round Hill Store tags Fairfield House and Garden and Rebecca's Restaurant!